We offer the best flat plate collectors, manufactured by Caleffi Solar, suitable for residential or commercial solar water heating projects. The collector features a low-profile design, which combined with ultra-lightweight melamine foam insulation, makes it one of the lightest flat plate panels on the market. The aluminum absorber sheet absorbs up to 95% of available sunlight converting in to usable heat. Flat plate solar collectors can be used for radiant heating, domestic hot water, pool heating, and more. 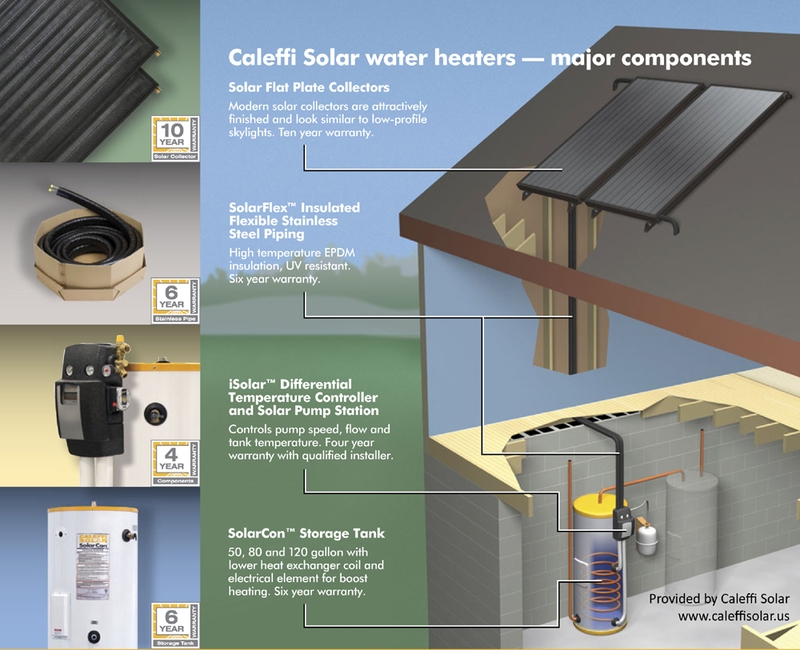 Caleffi Solar’s prepackaged, specially engineered system includes all of the components needed for a standard residential installation – from the solar collectors, to the pump station and controller, to the storage tank, and all of the necessary hardware and plumbing components. Our complete package is ready to be professionally installed and comes with the added assurance of a detailed warranty plan. Systems range in size from a one-collector system, intended for one-to two-person households, to a four-collector system, for households with six to eight people. Calefﬁ ’s Solar Water Heating System is equally compatible with newly constructed or existing homes, and its ﬂ exibility allows a variety of installation options, ranging from roof installations to ground mounts. We invite you to have a look at some of our recent projects.